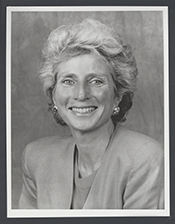 Jane Harman first won election to the House of Representatives in 1992, the breakthrough “Year of the Woman,” and became a leading figure in Congress on defense issues as a member of the Permanent Select Committee on Intelligence. In 2001, after leaving Congress for a term to run, unsuccessfully, for California governor, Harman reclaimed her former seat. “The quality of life in Congress stinks,” Harman said during her re–election bid in 2000. “On the other side of the ledger is the future of public policy in this country. And I’m a policy addict.” 1 During her second period of service in the House, she served on the intelligence panel and on the newly–created Committee on Homeland Security. Harman’s centrist record in the House reflected her district’s preferences. She joined the Blue Dog Coalition, a group of fiscally conservative Democrats. While Harman favored President Bill Clinton’s 1993 budget that increased spending and taxes, by 1996, she advocated spending cuts, the balanced budget amendment, and the line–item veto. In 1995, Harman co–authored the “Deficit Reduction Lockbox,” which required that spending cuts be applied to the deficit. She voted against the North American Free Trade Agreement (NAFTA) but backed the General Agreement on Tariffs and Trade (GATT). On social issues, Harman supported pro–choice measures, a partial ban on semi–automatic weapons, and the death penalty. When she returned to the House in the 107th Congress (2001–2003), Harman received a spot on the Energy and Commerce Committee and was re–seated on the Permanent Select Committee on Intelligence—a nod to her experience and continued influence. She served as Ranking Member of the Working Group on Terrorism and Homeland Security, a subcommittee of the Intelligence Committee. The terrorist attacks of September 11, 2001, dramatically increased the Intelligence Committee’s duties as well as its profile, and Harman’s expertise was valued on both sides of the aisle. She favored improved funding for the intelligence community as well as the expansion of counter–proliferation programs, and she backed the George W. Bush administration’s case for a pre–emptive strike against Iraq. 13 As early as October 2001, Harman pushed for the creation of a cabinet–level homeland security department that would have budgetary and oversight power, as opposed to the executive office that was initially established by the Bush administration. 14 Harman sat on the Select Homeland Security Committee when it was established during the 108th Congress (2003–2005). When it was reorganized as a standing committee in the 109th Congress, Harman retained her membership. From the 110th–111th Congresses (2007–2011), Harman chaired the Homeland Security Subcommittee on Intelligence, Information Sharing, and Terrorism Risk Assessment. In 2009, she authored the Reducing Over–Classification Act, which required the Department of Homeland Security to streamline the intelligence classification process, avoiding in part what Harman saw as “classifying information to protect turf or avoid embarrassment” as well as improving the fluidity of intelligence sharing between the local, state, and national levels. 20 The legislation passed in the House by a voice vote in the 110th Congress, though it failed to clear the Senate. When re–introduced in the 111th Congress, the bill easily passed both chambers. 1Eric Schmitt, “The 2000 Campaign: The House; Former Incumbents Try to Reclaim Seats,” 3 July 2000, New York Times: A11. 2Politics in America, 2004 (Washington, D.C.: Congressional Quarterly, Inc., 2003): 136. 3Robert D. McFadden, “Sidney Harman, Whose Hi–Fi Success Was Only the Beginning, Dies at 92,” 14 April 2011, New York Times: A25. 4Congressional Directory: 109th Congress (Washington, D.C.: U.S. Government Printing Office, 2006). 5Karen Foerstel and Herbert N. Foerstel, Climbing the Hill: Gender Conflict in Congress (Westport, CT: Praeger, 1996): 78; “Statement of Vote: Primary Election June 2, 1992,” California Secretary of State, http://www.sos.ca.gov/elections/sov/1992–primary/1992–primary–sov.pdf (accessed 1 May 2012). 6Election Statistics, 1920 to Present,” http://clerk.house.gov/members/electionInfo/elections.html. 8The Armed Services Committee was renamed the Committee on National Security from 104th–105th Congresses (1995–1999). 9Paul Jacobs, “Defense Firms Were Key Donors to Harman Races; Gubernatorial Candidate Says She Backed Industry in Congress to Protect Jobs in South Bay,” 11 May 1998, Los Angeles Times: A1. 10Cathleen Decker, “Showdown for Davis, Lungren: Voters Reject Millionaires Checchi and Harman in State’s First Blanket Primary,” 3 June 1998, Los Angeles Times: A1. 11Cathleen Decker and Mark Barabak, “Davis’ 4th–to–1st Comeback ‘Proved Pundits Wrong,’” 5 June 1998, Los Angeles Times: A1. 12Almanac of American Politics, 2004 (Washington, D.C.: National Journal Inc., 2003): 258; “Election Statistics, 1920 to Present,” http://clerk.house.gov/members/electionInfo/elections.html. 13Congressional Record, House, 107th Congress, 2nd sess. (9 October 2002): H7312–7313. 14“Harman and Gibbons Introduce ‘The Office of Homeland Security Act,’” 4 October 2001, Office of Representative Jane Harman, http://www.house.gov/harman (accessed 24 July 2002); Jane Harman, “Securing American Homeland Requires A Strategy,” 4 June 2002, The Hill: 26. 15Toby Eckert, “Harman, Others Call For Release Of Key Sections Of 9/11 Probe,” 9 May 2003, Copley News Service. The House and Senate probe was separate from the Report of the 9/11 Commission on Terrorist Attacks Upon the United States. 16Bill Nichols and John Diamond, “U.S. Begins To Downplay Hunt For Banned Weapons,” 13 May 2003, USA Today: 11A. 17Dana Priest, “Democrat Disputes Rice on Iraq Claims; Rep. Harman Says Intelligence Review Unearthed Scant Evidence of Weapons,” 30 September 2003, Washington Post: A13. 18Mark Mazzetti and Jeff Zeleny, “Next Chairman For Intelligence Opposed War,” 2 December 2006, New York Times: A1. 19“Harman Statement On Naming Of Rep. Silvestre Reyes As Chair Of House Intelligence Committee,” 1 December 2006, Office of Representative Jane Harman. 20Congressional Record, House, 111th Congress, 1st sess. (3 February 2009): H895. 21Congressional Record, House, 112th Congress, 1st sess. (18 February 2012): E291. Papers: 1960-1998 (ongoing), 110 linear feet. The Jane Harman Papers document the functions and activities of a Congressional office while incorporating facets of Harman's life before she became a member of Congress. There are very few materials regarding her personal life outside of her professional career. Types of materials include correspondence, reports and research materials, speeches, journal and newspaper articles, press releases, photographs, and video and audio tapes. The bulk of the papers date from 1993 to 1998 and focus on Harman's first three terms as a U.S. Representative from the 36th district of California. Major topics found in her political and legislative papers include national defense and the military (including women in the armed forces), the environment, space and technology, California-related issues, the Democratic National Party, health care, abortion and domestic and international economic concerns. Generally, there are more materials available from later in her political and legislative career than from the earlier years. Correspondence comprises at least half of the collection. Also well-represented are background and research materials that her staff used in legislative and political matters. Notable correspondents include: Les Aspin, Samuel Berger, Justice Harry A. Blackmun, Sen. Robert Byrd, President Jimmy Carter, President Bill Clinton, Gloria Feldt and Planned Parenthood Federation of America, Ruth Bader Ginsburg, Vice President Al Gore, Judith L. Lichtman (Women's Legal Defense Fund), Sen. Howard Metzenbaum, the National Abortion and Reproductive Rights Action League, Rep. Nancy Pelosi, Rep. Lucille Roybal-Allard, Rep. Loretta Sanchez, Ruth J. Simmons (Smith College president, 1995-2001), and Gloria Steinem. An inventory is available in the repository and online. "Jane L. Harman" in Women in Congress, 1917-2006. Prepared under the direction of the Committee on House Administration by the Office of History & Preservation, U. S. House of Representatives. Washington: Government Printing Office, 2006.